A pause before payrolls is normal, although we can note that the dollar often rallies on the Wednesday ahead of payrolls for reasons no one has ever discovered, so it must be position squaring. As noted above, the rate hike is baked in the cake almost regardless of data, since the Fed can point to lousy payrolls as "transitory." The CME FedWatch probability of a Dec hike is 81.7%, from 42.0% a month ago. The rate hike is going to have bigger consequences than we can imagine right now. We are now in a se-ries of hikes that are the first since June 29, 2006 (5% to 5.25%). This site has a chronology with name of Fed chair and key events noted: https://www.thebalance.com/fed-funds-rate-history-highs-lows-3306135. Up to now, the hikes have been creeping. We went from 0.25% to 0.50% in Dec 2015, to 0.75% a full year later in Dec 2016, and this year to 1% in March and 1.25% in June. The pace is accel-erating, to be sure, but the numbers are still low in the grand scheme of things. Today's traders cannot imagine Fed funds at 20% (March 1980 and again in Dec 1980). This is not a trivial point. An entire generation of traders in equities, fixed income, commodities and FX have never known a real cost to holding a position. Forward prices are based on relative interest rates. When every-one has rates at zero or only 1%, you don't have to care much how long you hold a position. When those numbers start rising, it can be an unhappy surprise. Another place rising rates can surprise is the sustainability of various debts. Those who locked in debt at fixed rates will be okay, but those with variable rates need to be examined more closely. The FT re-ports that "The CDX investment grade index — which reflects the costs of default protection on a bas-ket of 125 companies — dipped on Tuesday to trade at 54.4 basis points, its lowest level since 2007. This implies a cost of $54.4 to buy insurance on a $1,000 portfolio of bonds against default, compared with a peak of $27.80 during the 2008 crisis." Oh, dear. Granted, these are investment grade companies and thus supposed to be well able to weather storms, and might get a tailwind from US tax reform, to boot. Besides, a cheap repatriation tax will bring money home and reduce the need for issuance, reducing the supply of high-end paper in a market where demand is already outstripping supply. Historically low volatility is feeding investor confidence. "The yield on a widely tracked investment grade index from Bank of America fell to 102 basis points above corresponding Treasury yields, the lowest spread since June 2014. The equivalent CDX index for junk rated, or "high yield", companies also shows implied default risk at the lower end of historical levels but is not at a new post-crisis record. It sits at 320 basis points, down from 355 basis points at the start of the year." We admit we are no expert in corporate debt, high yield or otherwise. But rising rates have the capabil-ity of separating wheat from chaff. The same thing will happen in emerging market debt, another long-standing darling of yield-seekers. Not all emerging markets are created equal. Then there's mortgages, car loans, credit card debt, and even rents. We saw this wheat-chaff phenomenon in 1980 and we will see it again, if on a lower scale and in slow-motion. Those who do not learn from history and all that. But the fallout from rising rates is still a long way off. In the meanwhile, we can count on that Dec rate hike to provide dollar support. We have been judging that this pro-dollar sentiment can last until Draghi talks about tapering. To that we now have to acknowledge the new factor of which person is going to replace Yellen and how dovish or hawkish he may be (all the candidates suggested are male). This has been a factor simmering under the surface since the election, and it's coming home to roost now, even though we don't have a promised date for a decision. A few points: Trump may choose someone from outside the established circle. He named wildly un-qualified and inappropriate persons to the cabinet. Congresss is craven but can perhaps be counted on to reject someone too far off the beaten path, although it failed to do so in the cabinet cases. Secondly and far worse, he may choose someone who commits to deliver "personal loyalty" to him and him alone, as he tried to do with FBI director Comey and got a Justice Dept investigation into obstruc-tion of justice for his trouble. The Fed is supposed to be an independent agency, more independent than even the FBI. The BoE just held a party to celebrate its own independence. The first truly independent central bank was the Reserve Bank of Australia. People write PhD dissertations on central bank inde-pendence. It's a big deal. To provide a little nuance, the Fed is not 100% independent—it has to report to Congress. But Con-gress has shown itself in the semi-annual testimony to be a collection of economic ninnies. Greenspan used to run circles around Congressmen, openly insulting them and famously saying "If you understood me, I must have misspoken." One Congresswomen asked Bernanke at his confirmation hearing whether he knew anything about inflation and deflation, when he had written the definitive book on the subject. And technically the Fed president serves at the pleasure of the president, who can fire the Fed chief—but never has. As it happens, Yellen's term ends in early 2018 so that issue is not arising. But if Trump were to appoint someone who failed to keep a personal loyalty promise and then fired him, the finan-cial world would explode--twice. A Trump effort to take away the Fed's independence and make the Fed dependent on the president is a deeply unsettling prospect. It would damage the US' reputation far more than pulling out of the Paris Accord or any of the other stupid things Trump has done. It would tank the dollar, too. Look at what happened just yesterday—talk of a dovish Powell or even more dovish Kashkari took the dollar down. Not a lot and not fatally, but noticeable. We should probably put "Fed chief" in the wild card pile. Separately, some traders are gearing up for a showdown in Spain over Catalonia. Analysts say the EU cannot become a mediator because the Spanish constitutional is clear and has been adjudicated—Catalonia is not allowed to secede. In addition, it doesn't want to touch the secession issue with a bargepole because some other region may be waiting in the wings to secede. Press report are failing to come up with any credible names so far, but they must exist. Belgium, maybe. Where the rubber meets the road is falling demand for Spanish assets. Yields are on the rise, and rating agencies are going to start issuing reviews. DBRS is scheduled to announce a review on Friday and despite the rating agencies always being a day late and dollar short, Moody's and S&P can't be far be-hind. According to the FT, Moody's has already written "The ratcheting up of tensions has negative credit implications for the Spanish sovereign because it complicates the process of legislating policy." The FT writes the yield jump today was to the highest since March and the benchmark equity index fell 2%. King Felipe VI rebuked Catalonia. The Spanish 10-year bond was the second most-traded in the European sovereign debt market early today, accounting for over 10% of volume. The worst case sce-nario is the military option in which Spanish police and army occupy government offices in Catalonia. Yikes. To be fair, the yield is not setting hair on fire. See the chart. 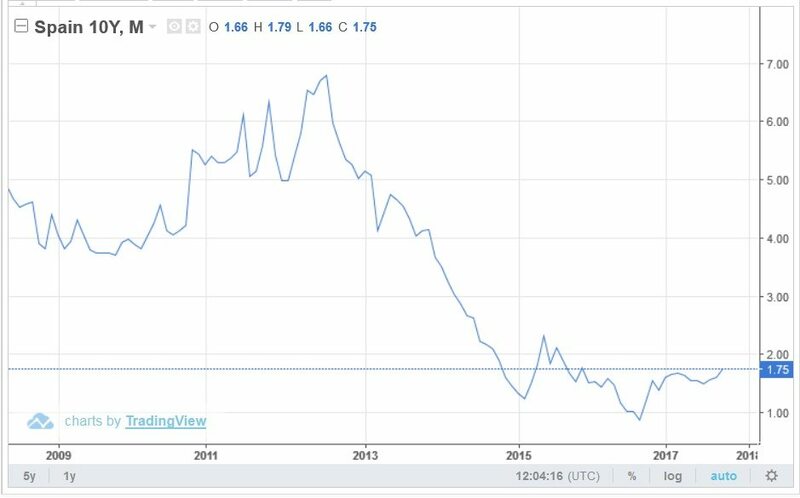 Tradingeconomics.com reports "Spain 10Y increased 0.05 percent or 0.05% to 1.75 on Wednesday October 4 from 1.69 in the previous trading session. Historically, the Spain Government Bond 10Y reached an all time high of 14.03 in October of 1992 and a record low of 0.88 in September of 2016." But it's early days. And the spread between the Spanish bond and the Bund could widen from 133 bp now to as much as 150 bp, according to Rabobank, cited in the FT. Demand for Bunds has risen and taken 3 bp off the Bund—so far. So, if Spain continues to scare investors and money sloshes over to Bunds while at the same time the rate hike and Trump reflation trade get a stronger grip in the US, the US-Germany differential can only widen in the US favor. This is a solid reason to favor the dollar, re-gardless of payrolls or Fed chiefs. See the Kshitij chart. It shows the 2-year differential vs. the euro/dollar. This is a tremendously impressive chart. The 10-year version is less dramatic; see it at http://kshitij.com/graph-gallery/bond/currency-yield-bundbond-diff-Medium-Term. The obvious point is that the euro is overpriced given the differential.